Mother Herbs give more emphasis on checking the quality of natural herbs and herbs supplements to ensure the supply of only high quality product in the market. Once a product has been produced, it undergoes a series of tests to assure consistency, quality and potency. The finished product is audited by inspector for bulk weight, liquid volume, plate count, bottle sealing and legible lot number, sample are then given to the Quality assurance labs, so that scientists can complete testing according to finished product specification. After all the processes have been completed and the product has passed the inspection QA will release the product. The batch record and a sample of the finished product are retained for future reference. If a customer has a question about a product QA can refer to the retention sample of the lot in question. Ash Testing - is simply a measure of the mineral content. The higher the ash count, the more minerals are present in the flour. To calculate ash count, the miller puts a sample into a container (called an ash muffle), and incinerates it in a very hot oven to burn off all the organic material, until all that remains is the mineral residue. This residue (or ash) is then weighed in relation to the original sample weight to calculate the ash count for that sample. Ash testing originated is a means of measuring the quality of the milling process. Finished Product Auditing  Once a product has been produced, each lot is statistically sampled and finally the product is audited by Quality assurance inspectors for bulk weight, Liquid volume bottle count, Bottle sealing and legible lot number samples are then given to QA labs so that scientists can complete testing according to finished product specifications. Microbiological Testing - Mother Herbs ensures the quality and purity of their herbs and natural herbs supplements by utilizing an instrument called a bactometer. It detects the growth of an organism by the change of electronic signal passed through the testing. E.coli Testing  The danger of the E.coli bacteria are well known. In large enough quantities, these bacteria can be fatal. Mother Herbs test sometimes raw material for the presence of E.coli using specially designed E.coli plate that contain an indicator that turn the bacteria blue. This allows for visual identification of the bacteria and of course rejection of that particular lot of raw material in necessary. Salmonella Testing  Mother Herbs test for Salmonella Sp. in herb raw material and product using what is called a 1-2 test. This test allows us to obtain what is called result much more quickly than standard culture method. Mold And Yeast Testing  Mother Herbs regularly perform yeast and mold count using the bactometer. Its special module contain the element a mold or yeast would need to sustain life if it were present when the organism grows, it is detected on the bactometer. 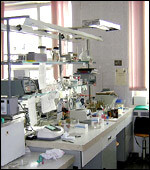 High Performance Liquid Chromatography  This extremely sensitive computerized tool allow Mother Herbs to analyze the ingredient in the mixture. Mother Herbs sometimes use HPLC to examine the purity and potency of raw materials mostly in economically feasible raw materials. Gas Chromatography (GC) -By using GC Mother Herbs can separate complete mixture of compound into individual component. A sample of a mixture is placed in the GC machine where it is heated and become gas. As the gas travels through a tube in the machine the individual element in the mixture separate and attach a special coating in the tube. These separated elements enter a detection unit called a mass spectrometer. Mother Herbs is closely associated with one of the best laboratories in India like Sri Ram Institute of Industrial Research (Delhi & Bangalore), S.G.S (Gurgaon), Reliable Labs (Mumbai) and we timely keep on sending our sample for research and analysis to ensure high quality products. On clients request all our herbs and natural materials can be irradiated with Gamma Radiation through Sri Ram of Industrial Research, Delhi. This ensures sterilized raw material for highly sensitive Pharmaceutical and Ayurveda formulations. These laboratories are committed to develop, innovate, analyze and apply technology for products and processes and are the pioneers in providing Inspection, Testing and Certification services to the Industries across India.